As we discussed in earlier posts, Kik is a social instant messaging app. It has a bit unique features than the other similar apps on the market. We have already taught you how to sign up and delete your account. But if you want a short break, here’s the method for Kik Deactivation. You can temporarily or permanently deactivate your account, according to your needs. Now, the process for that is really easy. 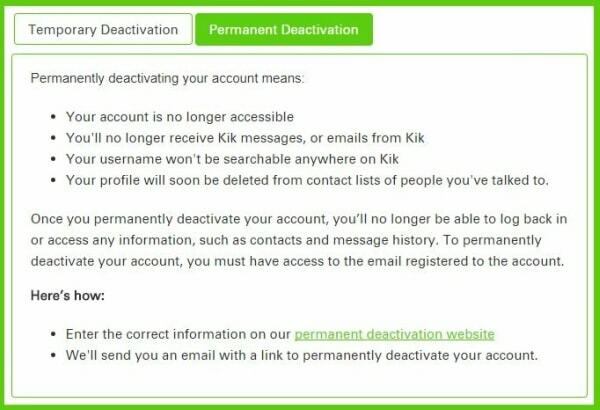 Just follow the steps given in the next section for Kik Deactivation. If you want a break from using Kik for whatever reasons, you can temporarily deactivate your account. And if you are bored of using the app, then you can just delete the account. Let’s see how to do that. Go to the official support page of the website from here. You will see a box with two options on the top. Scroll down and click on the relevant link. Enter your email address, the one you use with your Kik Account. You will receive a link on your email. Open the link from your email and confirm the deactivation. Now, your account will be deactivated for a short time. This means that you can go back whenever you want. You have to simply Log into your account on the app. This is when you want to permanently get out of the loop and don’t want to use the app. Here’s how it’s done. Go to the same support page as before and click on “Permanent Deactivation”. Click on the link given in the box at the bottom. Enter your username, email, and the reason why you wanna leave Kik. Check the box beneath it, and hit “GO”. After that, just open the link from your email which they will send you and confirm the deactivation. That is all there is to the process. By now, you know the process for Kik Deactivation, both temporarily and permanently. With this guide, you can easily carry out the processes. If you need any more help or need to solve queries, go to APKPie.